High end makeup, namely foundations, undoubtedly have a far better shade range than drugstore, well here in the Uk anyway. So if you have difficulty finding a drugstore shade then high end is definitely the way to go. But in terms of formula there are many drugstore and more affordable formulas I really love! L'oreal Lumi Magique foundation is one of my all time favourites and it costs a little over £10. Two of my all time favourite concealers (Urban Decay Naked Skin & NARS Radiant Creamy Concealer, read about those here) are high-end. However I have loads from the drugstore that I love and would happily carry on using forever! So I would shop high end for foundation and concealer if you have the money and need a good shade match, but there are definitely amazing formulas in the drugstore! See this post for my favourite drugstore foundations. In my experience powder formulas are far better if you pay a little extra. In terms of setting powders, finely milled and non cakey looking powders are what you're looking for, you're far better going high-end. I'm yet to find anything better than my greatly loved Hourglass Ambient Lighting Palette, at £59 they're not the cheapest but so worth the money in my opinion (read about them here). High-end Highlighters are also far better than drugstore options. I've found that some more affordable highlighters can be glittery and the formulas are not as creamy and smooth. But high-end highlighters tend be buttery soft and really give a glow without any glitter. My current favourite is the Anastisa Beverly Hills Glow Kit in Sun Dripped, see this post for details. I haven't really tried that many high-end bronzers and there are many that I love from the drugstore. but I feel like bronzers come down to shade preference, If you're really pale or really dark you probably have more options at high-end counters than the drugstore. For Blushes, I really don't think you need to pay a lot of money for them. With brands like Sleek they make amazing blush formulas you really don't need to go high-end. Now this is a tricky one. 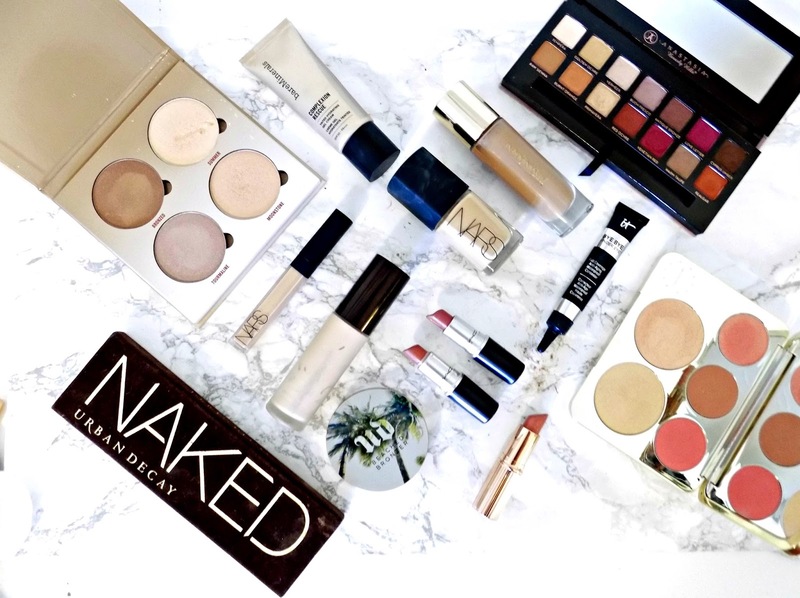 I have many drugstore eyeshadows I love and many high end ones; I love some Makeup Revolution palettes, and the L'oreal Single Shadows are brilliant (see this post) , and I'm not the biggest fan of the original Naked palette. But I think on the whole, high end shadows are generally better. The formula and blend-ability of high-end shadows tend to be much better. So I'd say go high-end for eyeshadows. Or definitely check out Zoeva Palettes, the price point is mid range but the formula, pigmentation and blend-ability is spot on! You definitely do not need to go high-end for mascara! Thats one thing the drugstore do brilliantly! I personally love L'oreal Mascaras, although at the moment I'm really loving Maybelline's Lash Sensational. This was another tricky category. In terms of Lipsticks there are so many I love from the drugstore. However, I do really love MAC Lipsticks, especially their matte formula and there shade range is incredible. And some high-end lipsticks I feel like you're paying for the packaging most of the time. I'm still yet to try a High end lip gloss or lip liner, I'm perfectly happy with ones from the drugstore - NYX have lip products down! Their butter glosses, matte lipsticks and Liquid Lipsticks are incredible. So I think this is all down to personal preference. I used to think that you didn't have to go high end for liquid liner. Until I tried the Lancome Grandiose Liner, which is amazing (read more about it here), I'm starting to think you probably do -If you want something to last all day, easy to apply and is super pigmented. I'm perfectly happy with drugstore brow products and I'm yet to find a high-end one I love more. But again the high end shelves have a better colour selection. I think there are so many great high-end makeup products and some equally as great ones in the drugstore. So it all comes down to personal preference and what you want out of your makeup. Do you prefer high-end? Or are you drugstore girl?